As I'm sure most are aware at this point, SCCA now requires all SCCA sanctioned event attendees to be SCCA members. In order to accommodate this membership requirement the SCCA has made available special temporary "Weekend Memberships" so that non-members are still able to participate. paper-trail/forms/documentation necessary to satisfy the Weekend Membership program. Now there is a better way. MyAutoEvents.com has worked with the SCCA to provide a mechanism to submit the weekend membership request electronically at the time that online registration is submitted for an SCCA event. If a Weekend Membership request is submitted electronically and a temporary Weekend Membership Number is obtained, no additional paperwork is required. MyAutoEvents.com is making this functionality available for NO ADDITIONAL CHARGE* to SCCA Regions who process event registration online through MAE. 1. 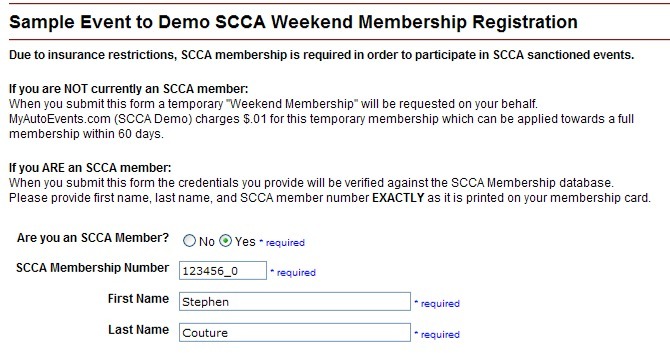 Contact the SCCA Membership office to request a "Token" for use in submitting electronic Weekend Membership requests. The token is a unique identifying string (a GUID) which will authenticate your region's electronic requests sent to the SCCA from MAE. 3. Activate online registration for your event. 4. On the Online Registration Setting page - set Enable to "Yes", input your Region's Token, and specify the amount to be collected for the Weekend Membership. Note: The charge input here is communicated to the entrant on the registration submission page and collected IN ADDITION to any entry fee collected if online payments are accepted for your event. 5. For entry fees there is no longer a need to specify member and non-member fees. If a weekend membership is requested, the weekend membership fee will be added to the entry fee collected automatically. 8. When a member submits their registration, their membership credentials are verified against the SCCA membership database. When a non-member submits their registration, a Weekend Membership request is submitted electronically and the resulting Weekend Membership Number is added to their entry information. 9. If a weekend membership is requested and an online entry fee is selected, the weekend membership fee will be added to the selected entry fee and collected from the entrant in one charge. 10. SCCA Membership information/validation response is shown on the entry detail page and in the Excel Download as "Membership Status".